House and time at Malvern: No 7, 1897 - 1900. Died: 28 October 1914 aged 32 in France. Killed in action at Neuve Chapelle. Son of Colonel J. McCleverty, Greycourt, Fleet, Hants, b. 1882. Army III—I. Lambert German. House Prefect. House XI Football. R.M.C. Sandhurst; West Riding Regt. 1901; Indian Army (47th Sikhs) 1903; Captain 1910; South African War 1901-02, Queen's Medal with 5 Clasps. 'He was the third of four brothers here, all of whom later became members of the Indian Army. We print an extract from a letter written by his Commanding Officer, and it is sufficient to say of him that he died as he had lived—a soldier to the core and a type of all that is best in the British Officer. "He was killed in an attack on a village just after we had carried it with the bayonet. 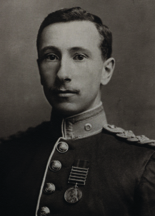 For the attack we were congratulated by Sir H. Smith-Dorrien for what he called 'magnificent behaviour'. Robert's leading all through was splendid, as cool as if engaged in manoeuvres, but inspiring all round him by his dash. He was killed close to me when leading the attack on through the village, killed instantaneously, shot through the head. I cannot express properly how all ranks in the Regiment grieve at his loss, the most popular of all and a splendid officer in every way."' (Malvernian, Dec 1914).